Home/Stop Funding Hate, The Co-operative/96% of Co-op members back Responsible Advertising – what happens next? This week, the Co-op AGM voted overwhelmingly in favour of Stop Funding Hate’s motion on Responsible Advertising. Even we were surprised by the scale of the win – with 92,881 members backing the motion – 96% of those who expressed a preference. “The Board’s view is this is something that should go to our members… there should be a vote on it, the Board should reflect on it & then we should come back to you with what that deliberation brings”. What is the Co-op’s current advertising policy? Back in October 2016, the Co-op announced that it was “looking at our advertising for next year to see whether we can align it more closely with our natural sources of support rather than more generic media advertising”. The company also stated that the Group’s Co-op Way Policy Committee was “working systematically” through all its policies, and that “We aim to have our high level policies in shape by our AGM next Spring… at that point we intend to bring a number of items to the Membership for their consideration”. In March 2017, the Co-op gave a further update, announcing that it planned to continue advertising with the Daily Mail, Sun and Daily Express, but committing to “challenge those views expressed in print which we and many of our members believe are incompatible with our values of equality, solidarity, self-help and openness”. The Co-op said it had “decided to use our contacts with publishers at every level to make the case for change. To tell them how our members felt and why the stories they have published challenge the relationship we have with them. We’ve already had meetings with senior executives at the Daily Mail and The Sun, and the discussions will continue”. In addition, the Co-op would “look at using our advertising in these titles to tell their millions of readers about some of the things our Co-op is doing to tackle issues that we feel strongly about, such as modern slavery or water poverty in Africa and promoting Fairtrade programmes in developing countries”. Many Co-op members had expected to get the chance to vote on the company’s advertising policy at the 2017 AGM. In the end there was a fringe meeting on the issue, but no vote was taken. While Stop Funding Hate has never called on any advertiser to lean directly on a newspaper over its coverage – and while we are sceptical about the effectiveness of the current approach – we respect the fact the Co-op Group has responded positively to member and customer concerns. “to review the impact of the current advertising policy and report to members: the specific issues publications have been engaged on; the impact of this engagement; and processes by which impact is monitored”. 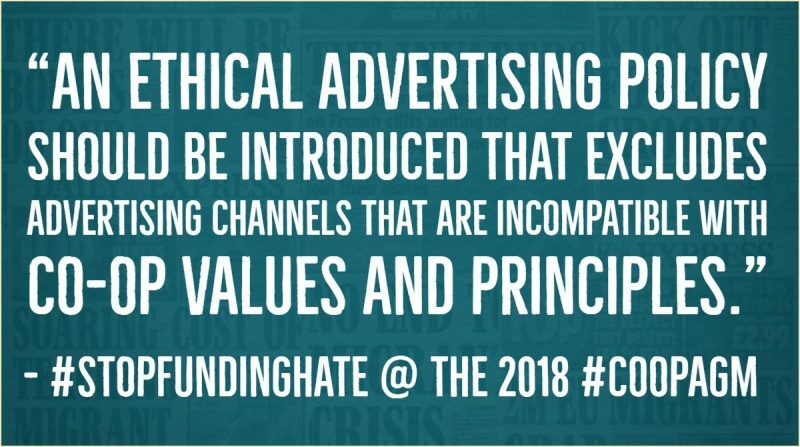 “to prepare an ethical advertising policy that puts controls in place to ensure adverts do not appear in media that are incompatible with co-operative ethics, values and principles”. In our speech to the conference, Stop Funding Hate Board member Colin Baines made it clear that the latter would be our preferred outcome. But in any event, the Co-op Group’s current policy has been in place for over a year now – so if it has had an impact, then the Board should be in a position to evidence this. From Fairtrade to modern slavery, the Co-op has a proud history of breaking new ground in corporate social responsibility. Amid growing calls from consumers around the world for companies to ensure they do not fund hate media and fake news, ethical advertising is fast emerging as a mainstream business ethics issue. Global leader Unilever recently promised that “we will not invest in platforms or environments that do not protect our children or which create division in society, and promote anger or hate”. 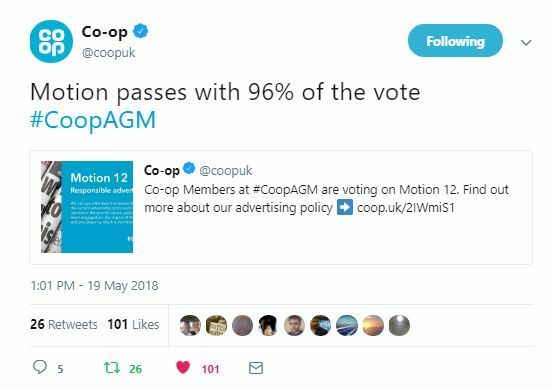 From the emphatic support for Stop Funding Hate’s AGM motion, it is clear that many Co-op members would like to see their company take a similar stance. The Co-op Board has promised to reflect on the vote, and report back to members on their deliberations. Stop Funding Hate will be writing to them soon to offer our support on this issue. We’ll also be contacting the Co-op National Members Council to thank them for backing our Resolution, which is a vital endorsement. We’ll give further updates as the discussion develops. See also: What’s the long-term goal of Stop Funding Hate?